The Rance Tidal Power Station is the world's first tidal power station and also the world's second biggest tidal power station. 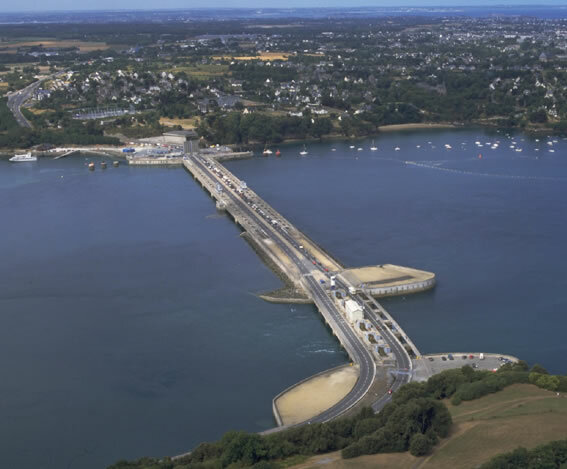 The facility is located on the estuary of the Rance River, in Brittany, France. Opened on the 26th November 1966, it is currently operated by EDF, and is the second largest tidal power station in the world, in terms of installed capacity. With a peak rating of 240 MW, generated by its 24 turbines, it supplies 0.012% of the power demand of France. With a capacity factor of approximately 40%, it supplies an average 96 MW, giving an annual output of approximately 600 GWh. The barrage is 750m (2,461ft) long, from Brebis point in the west to Briantais point in the east. The power plant portion of the dam is 332.5m (1,091ft) long. Power is generated from 24 bulb turbines with a 5.35m (17.55ft) diameter that rotates at 93.75rpm and is rated at 10MW at a head of 5.65m (18.54ft). The facility is located on the estuary of the Rance River near Saint Malo, Britany, France. This estuary has an average tidal range of 8.2m (13.5m maximum) with a reservoir of 184,000,000m3 over a 22km2 basin area that creates a maximum flow of 9,600m3/s. It took six years to complete, and was commissioned at various stages between August 1966 and December 1967. The following were the most important stages of its construction: January, 1961: commencement of work. 19th November, 1962: commissioning of the lock. 24th March, 1963: commissioning of the sluice-way section of the dam. 20th July, 1963: final closure of the dam across the estuary. 19th August, 1966: on-line connection of the first power set. 26th November, 1966: inauguration by the President of France. 1st July, 1967: inauguration of the road across the dam. 4th September, 1967: commissioning of the twenty-fourth power set. The plant is currently operating. The barrage has caused progressive silting of the Rance ecosystem. Sand-eels and plaice have disappeared, though sea bass and cuttlefish have returned to the river. By definition, tides still flow in the estuary and the operators, EDF endeavors to adjust their level to minimize the biological impact. La Rance Tidal Barrage is located in France. The Rance Basin has undergone a full scale evaluation of the ecological impact of the tidal power station during 20 years of operation. Significant impact during the 3-year construction phases and closing of the estuary provoked disappearance of marine flora & fauna due to salinity fluctuations, heavy sedimentation and accumulation of organic matter in the basin. The new ecological equilibrium, established in the space of 10 years remains fragile and being linked to the degree of stability of abiotic conditions, dependent to a large extent on the operation conditions of the power stations. By 1976, the Rance estuary was considered again as richly diversified: a new biological equilibrium was reached and aquatic life was flourishing again. Mean water level and hydrodynamic regime. The 2.5 m rise of the mean water level has resulted in a decrease of the tidal range which includes less volume of water entering the estuary the slack period to be longer. Modification of tidal stream in the estuary, in particular during ebb has provoked more silt deposit in the low intertidal zone. When comparing the Rance estuary with other regional estuaries, sediments dynamic processes are similar to those of natural estuaries. General Flora and Fauna distribution. An increasingly diverse flora and fauna became established. The patterns of distribution of this flora and fauna, their grouping into ecological units and the nature of their interrelationships, indicate a variable degree of biological adjustment to the new environmental conditions. Distribution of benthic species and communities. By 1980, the basin was providing habitat for 110 worm species and 47 crustacean species. Scallops and Belon oysters are now the new fishery activities. Utilization of the basin by overwintering birds. Since 2000, a seal female has been living in the basin, passing through the sluice gates or even the lock. Despite vain attempts to send her back to join seal communities, she always goes back to the Rance estuary! Laleu, V., 2009. La Rance Tidal Power Plant. 40-year operation feedback – Lessons learnt (ppt presentation). Retiere, C., 1994. Tidal power and the aquatic environment of La Rance. Biological Journal of the Linnean Society, 51, 1-2: 25–36. Andre, H., 1978. Ten years of experience at the “LaRance” tidal power plant. Ocean management Ocean Management, 4, 2–4:165–178.